A humorous animated film from one of anime's hottest directors, covering youthful love in a modern setting full of temptation that's sure to entice you until the end. When it comes to anime directors who have been pushing very creative works over the past 4-5 years, one name that comes up to many anime fans would be Makoto Shinkai. After all, Shinkai directed one of the most popular anime movies ever with Your Name. However, there’s also another director that’s worthy of mention, and it’s none other than Maasaki Yuasa. 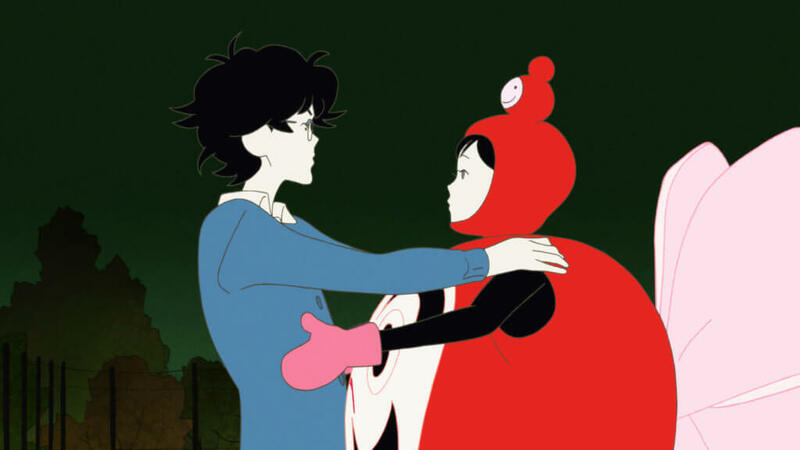 While Yuasa has gotten attention for his recent work — Devilman Crybaby, a modern take on Go Nagai’s classic Devilman series — he released a slice-of-life anime movie in 2017 that is worth any anime fan’s wild, and this film is quite wild. 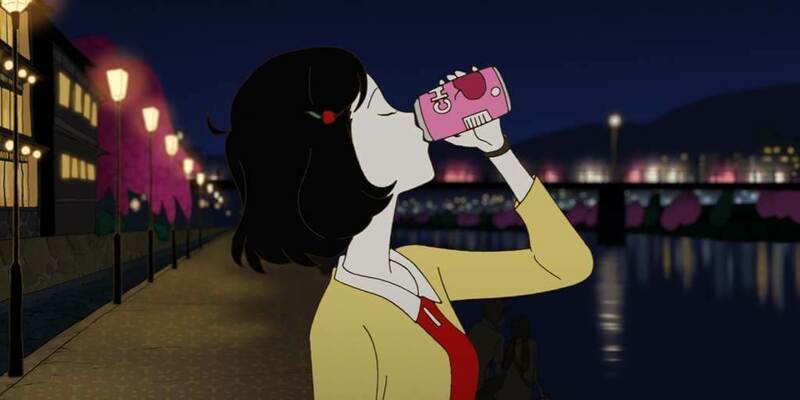 Yuasa’s The Night Is Short, Walk On Girl is a romantic comedy that takes viewers on a wacky journey through the complications of love. The Night Is Short, Walk On Girl stars a young, nameless female university student (referred to as “The Girl”) and her experience one night in Kyoto. She decides to go out drinking and meets a whole slew of characters who relish the nightlife. While the Girl is having fun, her secret admirer, known only as Senpai, tries to court her by showing up whenever she’s nearby. Unfortunately, he lacks the confidence to directly tell her his feelings. Both the Girl and Senpai keep missing each other due to various events that test their fortitude throughout their time under the darkness. From a used book festival, to a guerrilla theater screening, to a major sickness infecting Kyoto, the two characters slowly come to terms with their own feelings and begin to take steps to a meeting that might change their lives forever. If you love sakuga and/or anything related to animation, The Night Is Short, Walk On Girl is something to behold. Every visual looks amazing. Although the characters are modern, they give off a well-done retro vibe, like something out of an early 20th century animated film. The film also does an excellent job of portraying the zaniness of modern nightlife. Bars, late-night parties, sexual ventures, people staying up late for no reason – it’s quite a fun trip into a world that’s full of risk and danger, but full of high reward as well. As far as the cast of characters, they certainly are believable. The Girl is a gung-ho young woman who is always pressing forward. The beginning of the film has her take on a powerful old man in a drinking contest. Then she goes on to look for a book she loved as a kid at a used book festival. Later, she acts in a guerilla play and decides to heal everyone from a nasty cold. The Girl does so much in the film that you can’t help but love her enthusiasm. Senpai is also a notable character, as he gets caught in a hijinx full of sexual innuedo. He’s a character that most people can’t stand – the person who just stalks their love interest and doesn’t bother to talk to them. However, over time, viewers get to see his thought process, which is another visual treat. You start to see the internal conflict he has regarding his love for the Girl, and it’s something most of us we can relate to. There are other fun characters in the film, from another hopeless romantic named Don Underwear, to nightlife veteran Higuchi. They represent archetypes that one who’s well-versed in nightlife know and have met. The animation and characters make this story very funny and deep. The Night Is Short, Walk On Girl is not only a love story, but also one about modern life and its tendency to isolate people from one another, even in large urban areas. The film preaches the importance of connection, a theme that most fans hear about in other series and media. So if there’s one flaw about the movie, it’s that the message behind the cold wave in the last part of the film preaches a final point about connection, but it comes off a little too ridiculous, even for a story that’s supposed to be outrageous to begin with. The Night Is Short, Walk On Girl is definitely a must-see for anime fans. 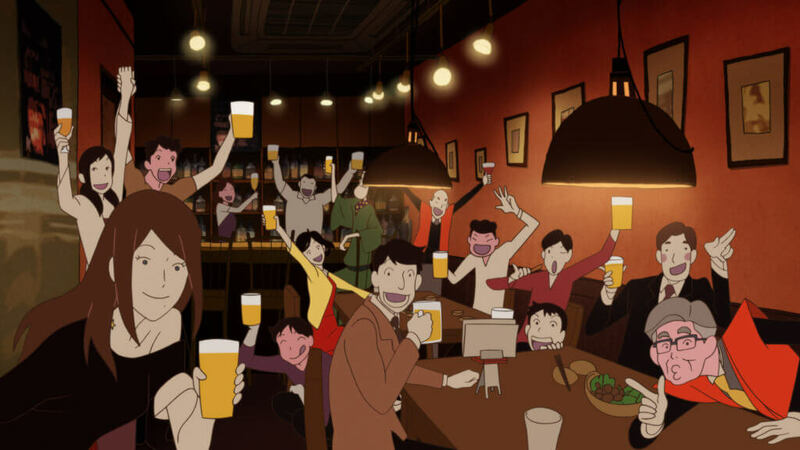 Yuasa has crafted a trippy, hilarious and endearing film, with a cast of characters who you might want to have fun with in real life. Fans of The Eccentric Family and The Tatami Galaxy will really love the film, as it captures aspects from both series (the film is based off a novel from Tomihiko Morimi, who also wrote the original novels for those series). The Night Is Short, Walk On Girl is a visual spectacle that shows how beauty can shine in darkness. And more importantly, we can walk alongside it and make that moment memorable. A ticket was provided by Japan Society. At the time of publishing, The Night Is Short, Walk On Girl is currently showing in theaters. You can check screenings in your local area at GKIDS’ official website. The movie is also available on Blu-Ray/DVD in Europe. Story is well-supported through the film's theme of "connection"
The climax of the movie isn't as strong as its beginning and middle portions.